An accidental breeding has occurred and I'm curious what the outcome for the puppies will be. I am not a breeder. My merle bred the neighbor's mismarked female. This is an older picture of the male that best shows colors. He has two blue eyes. The female is a black tri with excess white on half of face with brown eyes. Both ears are black. Black eye rims. 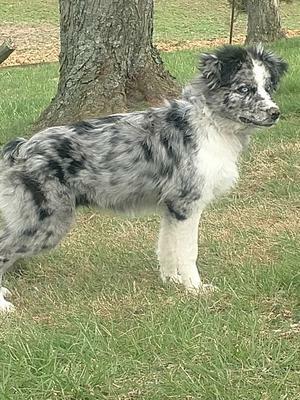 The breeding between a merle and a tri colour is fine - it’s merle to merle that has problems. The mismarking on the mother is not an issue either. It only matters if you want to show the dog, then it needs correct markings. There are usually no health issues with mismarking, and you can get correct colouring on the pups!